We all know that everyone has been waiting patiently for the BIG Raffle Draw of the West Jet Voucher. We held the draw at noon today and the video reveals the lucky winner. Congratulations to our lucky winner and thank you to all those that purchased tickets to support our local mentoring programs. Thank you to Big Brothers Big Sisters of Canada and WestJet for the voucher and Boiling Over’s Coffee Vault for helping us sell tickets. A special thanks to Danielle Sparkes, our summer activity coordinator for her hard work selling tickets throughout our area at place such as Classics on Kent (LDBIA), Lindsay Farmer’s Market, Fenelon’s Farmer’s Market, Bobcaygeons Farmer’s Market and Second Time Around in Minden. 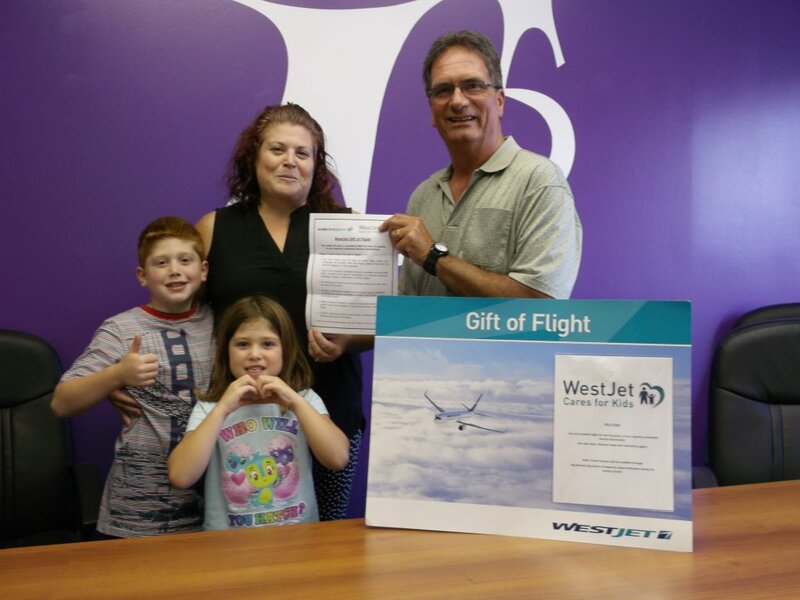 The lucky winner of the West Jet Voucher dropped by to pick up her voucher the other day! It was nice to meet Ang and her children. Thanks again to Big Brothers Big Sisters of Canada and WestJet Cares for Kids for providing this great opportunity!